BAFTA is set to host a special masterclass at this week’s Belfast Media Festival. The session is set to take place on Friday November 18th at 12:30pm in The MAC Theatre, Belfast. Focusing on production craft, the senior members of the award-winning team will discuss how the series concept was created and give insight into their use of the latest gyro stabilised technology and 4K cameras. Techniques and technology that allow the viewers at home feel closer than ever to the action across powerful six to eight minute sequences. 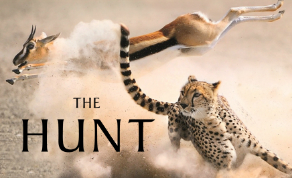 A major landmark series, ‘The Hunt,’ looks in detail at the fascinating relation between predators and their prey. Rather than focusing on the ‘blood and guts’ of predation, the series applies dramatic technique to natural history, pushing the boundaries of high-end specialist factual television through the documentation of the strategies used by predators and their prey. Belfast Media Festival celebrates their 7th annual Media festival this year and invites anyone with an interest in broadcast and digital industries in Northern Ireland to join them this week. The festival will be attended by a number of top industry names including Charlotte Moore, Director Content, BBC, Ralph Lee, Deputy Chief Creative Officer, C4 and Damian Kavanagh, Controller BBC 3 Online.